An 8 £/kW capacity price has major implications for the UK capacity mix, pricing dynamics and asset investment decisions. There have been genuine reductions in the costs of flexible capacity over the last 12 months. These have been supported by falling costs of capital as investors target UK power infrastructure. But capacity cost reductions had little to do with an auction clearing price of 8.40 £/kW. The auction result was instead driven by lower than expected exit price levels for older coal & CCGT plants. These are hard to reconcile with the gap between current unit margins and fixed costs. But low bids suggest an unwillingness from owners to close older plants, whether for ‘strategic’ or other reasons. A range of analysis has been published on why the T-4 auction cleared at 8 £/kW. In today’s article we focus instead on implications of the auction result. We consider what it means for evolution of the capacity mix, market pricing dynamics and asset investment. Successful and unsuccessful capacity in the auction are summarised in Chart 1. 2.2GW of interconnector capacity was successful across three projects, Eleclink (UK-FR), NEMO (UK-BE) and IFA2 (UK-FR). 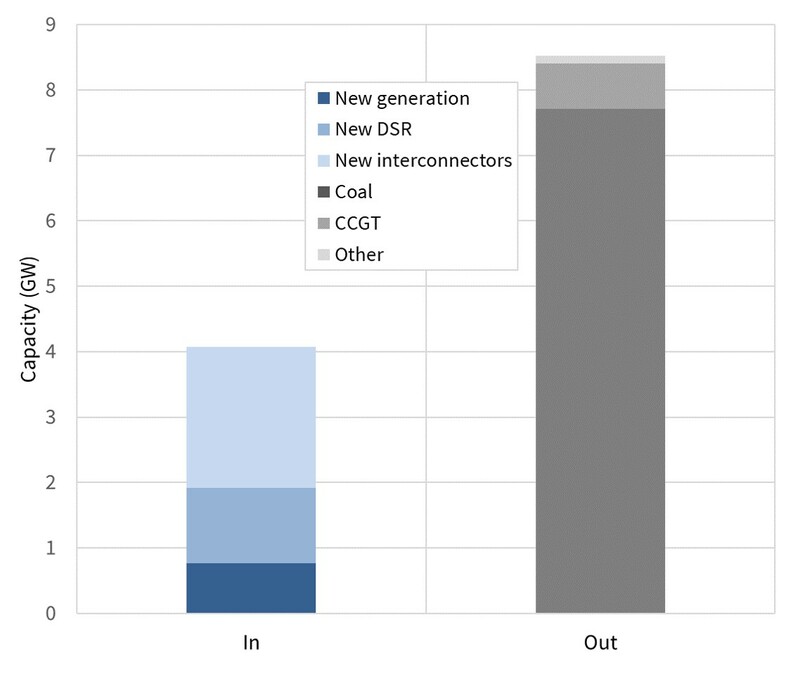 0.8GW of new generation capacity was dominated by distribution connected gas engines. 1.2GW of new DSR was also strongly influenced by engines and batteries behind the meter. 8.5GW older existing thermal capacity exited the auction. 7.7GW of coal units, 0.7GW of older CCGTs and 0.1GW of coal plant GTs and engines. Fiddlers Ferry (1.7GW) and Cottam (1.8GW) will likely close after the 2018-19 capacity year given these plants have no capacity support beyond. Aberthaw (1.5GW) will likely close after 2020-21 given no agreement beyond. West Burton (1.8GW) has no capacity agreement in 2019-20 but does have one in 2020-21. This plant is likely to remain open until early next decade hunting T-1 support, but in doing so may supress T-1 prices. Beyond 2021-22 the UK coal fleet is likely to be reduced to the IED compliant Drax coal units (1.2GW) and Ratcliffe (1.8GW). Based on current market conditions the UK may well achieve its targeted closure of all coal stations prior to 2025, on an economic basis alone. The replacement of mid-merit with peaking plants, accelerates a trend established in the previous three auctions. While it fulfils the government’s goals in a capacity accounting sense, it will have some important implications for wholesale market pricing dynamics. Changing stack shape is set to support super peak prices. The removal of coal units means prices will more often need to rise to bring on gas engines during periods of high net system demand. This is likely to increase the peak/offpeak price ratio as well as supporting spot price volatility. The competitive position of new interconnectors in the supply stack depends on price levels in foreign markets. Under normal market conditions, the interconnectors will tend to import cheaper power from the Continent. But Winter 2016/17 has shown that flows can dry up or reverse during periods of UK system stress, if these coincide with stress in Continental power markets (e.g. FR, NL, BE). 3GW (nameplate) of new interconnector capacity will support price convergence with the Continent. This will make it much more difficult for other new interconnector projects to follow. None of these are insurmountable, but they bring National Grid’s current review of balancing services procurement into focus. Investors are keenly aware of a key policy question arising from the auction result. Are the regulatory authorities and National Grid (as TSO) comfortable with the type of capacity being delivered by the market? Toughening of DSR performance standards would erode competitiveness of behind the meter flex. Four capacity auctions have now passed and a large new CCGT project is yet to succeed. However behind the scenes new CCGT costs continue to fall, due to a combination of rising efficiency, falling turbine costs and reductions in cost of capital. Despite this it will be difficult to build new CCGTs with capacity prices below 20 £/kW. This means new CCGT projects remain queued to cap any capacity price rises above 25 £/kW. More efficient and flexible existing CCGTs are set to benefit in the wholesale market from the supply stack transition. The increasing influence of higher variable cost peaker/DSR capacity supports CCGT margin rents. But an 8 £/kW capacity price is a tough price to absorb for these benefits. A single digit clearing price has caught owners of existing CCGTs by surprise. It brings brings future bidding strategy & closure decisions sharply into focus for older, less efficient and less flexible CCGTs. These older CCGTs have fixed costs of 20-25 £/kW. On a risk adjusted margin basis it makes no sense to stay open with single digit capacity prices. The dynamics around exiting CCGTs should provide significant price support around 15-20 £/kW in the next few auctions.